This is a recipe for our Tumbleweed Farm CSA members this week. We’re harvesting beautiful collard greens and amazingly sweet salad turnips (the variety we grow is Hakurei) and this simple slaw makes for a lovely summer side dish. 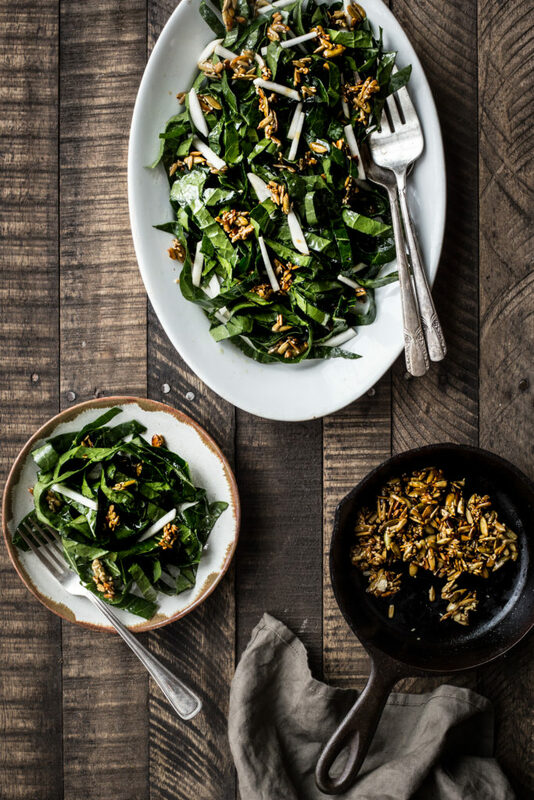 The collard greens are dressed in a ginger-sesame dressing and topped with a seedy-crumble that takes things up a few notches. I know a lot of folks believe that collards need to be cooked down for a long time to become tender but this slaw is a great gateway for enjoying collards raw. They’re very tender and almost sweet. The key is slicing them thinly and massaging the leaves with the dressing to help break down any toughness and help the leaves absorb the dressing. This is the kind of salad that makes me love the summer bounty and reminds me that simplicity really cannot be beat when it comes to fresh produce. In a small bowl whisk together the rice vinegar, ginger, 1/4 teaspoon red pepper flakes, and 1 teaspoon of the honey. Drizzle in both the oils and a pinch of salt. Mix well. Combine remaining 2 teaspoons of the honey, remaining 1/4 teaspoon red pepper flakes, and 1 tablespoon of water in a small bowl. Toast sunflower, pumpkin and sesame seeds in a medium sized skillet over medium heat, shaking the pan a few times until the sesame seeds are lightly browned. About 3 minutes. Add the honey mixture and cook, stirring, until seeds stick together in small clumps, about 3 minutes. Scrape seed mixture to parchment paper; let cool. Break into small clusters. Toss the collard greens with 2 teaspoons of the dressing and use your hands to gently massage/rub the dressing into the leaves until they become tender and turn a dark green, about 30 seconds. Toss the collard leaves with the sliced turnips and drizzle with more dressing. Divide salad between plates and top with seeds.